American pickup Dodge Ram 2016-2017 model year we decided to dedicate our review. Dodge Ram is so interesting and unique model that talk about a pickup truck can be a very long time — the Ram 1500, the Ram 2500, the Ram 3500 their numerous versions and modifications can confuse even the very erudite motorist. 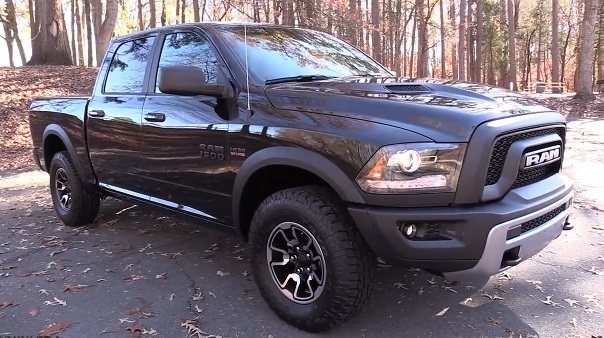 Of the whole family Ram Trucks stop the attention of our readers to the most bright representative — Ram 1500 Laramie Limited and this pickup to conquer off-road Ram 1500 Rebel created to compete with the Ford F-150 Raptor. We offer photos and videos, prices and equipment, specifications Dodge Ram 1500 2016-2017 year. Price Ram pickup truck in 1500 in the US is from 26145 to 57300 dollars, pickup-SUV Ram 1500 Rebel can be bought for 43270-46890 dollars. The cost of the American pickup truck in Russia in a chic version of the Ram 1500 Laramie with 5.7-liter petrol V8 of 74-75 US dollars. Ram 1500 Laramie Limited chic pick-up appearance is a matter of respect of others. The sheer size, the abundance of chrome parts (false radiator grille, bumpers, mirror housings, moldings, trim and even steps), large 20-inch polished aluminum wheels with tires P275 / 60R20 — one word purebred American who loves to impress. Pickup Ram 1500 Rebel opposite stripped of tinsel, and his whole appearance hints at the desire of the mud puddle. Available clipped the bumper, protect the edges of the wheel arches and lower side windows, a powerful towing lug at the front and rear, off-road tires Toyo Open Country A / T standard size LT 285 / 70R17E on 17-inch alloy wheels made of aluminum alloy. Such brave talk and brutal. External dimensions Body Dodge Ram 1500 Crew Cab 2016-2017 years (loading platform 5 feet 7 inches -170 cm) is 5817 mm long, 2017 mm wide, 1994 mm in height, with 3574 mm wheelbase and 234 mm of ground clearance . American pickup trucks, and passengers are not tall can just get lost in the cabin. Maximum saturated picking pickup Dodge Ram promise a rich set of options available dual-zone climate control, a color 7-inch screen trip computer with selectable output information, multifunction steering wheel, heated rim, heated front and rear seats, power driver’s seat and front passenger, electric drive pedal assembly, LED backlighting interior, electric sunroof, multimedia system Uconnect system with 8.4-inch touch screen (navigation, telephone, SD, USB, AUX), speaker Alpine system with 9 speakers, the Automatic High Beam Headlamp Control, heated exterior mirrors, electric adjustment and auto-folding function, rear view camera, rear Park Assist System, central lock and factory alarm. Specifications of the new Dodge Ram 1500 2016-2017 year. Under the hood of the pickup according to the customer is possible to install two petrol and one diesel engine is paired with the automatic transmission 8. Gasoline engines for Dodge Ram pickup truck. 3.6-liter Pentastar V6 (305 hp, 365 Nm). 5.7-liter Hemi V8 (395 hp 556 Nm). 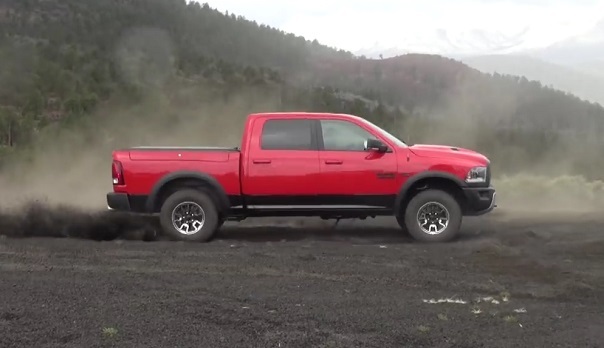 The new diesel engine for the Dodge Ram pickup. 3.0-liter EcoDiesel V6 (240 hp 570 Nm). Body pickup frame fastened to a powerful high torsional rigidity coefficient manufactured from high strength steel using hydroforming technology (high dimensional accuracy and a minimal amount of compounds). In the presence of the new 8-speed transmission TorqueFlite 8 Eight-Speed Transmission with a convenient rotary control if taken from the interior of British Jaguar and Land Rover. Off-Road 2 (for extreme off-road mode with a ground clearance of 270 mm). After a description of the air suspension provides a serious ground clearance to talk about the fact that you can order a pickup with a drive only to the rear wheels is not appropriate, although there are variations. Of course only a 4×4 wheel drive and always with the optional limited slip rear differential.